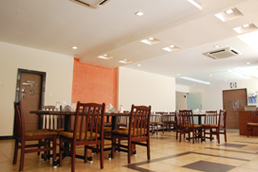 This idyllic resort is situated on the backwaters of the Panchagangavalli river and is located in Kundapura town. A warm and welcoming luxurious resort on the coastal belt - it is surrounded by a cluster of mystical islands. 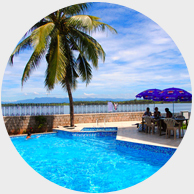 This family owned and operated resort offers the finest in accommodation, amenities and services. Blue Waters is ideal for a thrilling family vacation or a relaxing gateway and home to some of the best sea food in the world. This rugged green paradise is nestled on the ridge line of a private peninsula. Here lies a place of serenity, beauty, healing and harmony. A secluded retreat where the pressures of life cease to exist and where the body, mind and spirit find nourishment. This is Blue Waters. Enjoy the sweeping views of surrounding islands and coconut groves from your guest suite, relax with a refreshing glass of wine/ice tea at the river front from our tastefully created SPICE CUBE restaurant. Swimming pool and a baby pool available to our guests, While the outdoor pool are always a popular venue with a beautiful view of the lake and Kodachadri Mountains, the area also includes a baby pool and an adjacent Garden. For the health and safety of our little members, both of these areas are deemed as Non-Smoking. Our contemporary restaurant Spice Cube blend flavours - fusion between South Canara base culture and Continental cuisine. Also, the platters are arranged using various plating techniques - stacking high, using sauces to create patterns, garnishes for colour offering unique dining experiences from cuisine prepared by entertaining Continental chefs in south Canara, to fresh, local seafood and seasonal produce showcased. Free Wi-Fi & High Speed Internet! !